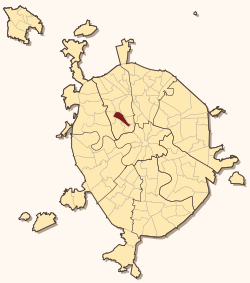 Aeroport District (Russian: райо́н Аэропо́рт - Airport District) is an administrative district (raion) of the Northern Administrative Okrug and one of the 125 raions of Moscow, Russia. The area of the district is 4.58 square kilometers (1.77 sq mi). The aviation companies Irkut, Ilyushin, and Yakovlev have their head offices in the district. The New Humanitarian School, a private school, is in the district. ↑ "Contact Information Archived September 30, 2011, at the Wayback Machine.." Irkut Corporation. Retrieved on 30 August 2011. "Corporate Centre address: bldg. 1, 68, Leningradsky prospect, Moscow, 125315, Russia" - Address in Russian Archived September 12, 2011, at the Wayback Machine. : "Корпоративный Центр адрес: Россия, 125315, г. Москва, Ленинградский проспект, дом 68, стр. 1"
↑ Home page. (Archive) New Humanitarian School. Retrieved on May 21, 2012. "Krasnoarmejskaya st., 30”Б” 125319, Moscow, Russia"